The CyberPower Standby CP550SLG uninterruptible power supply (UPS) safeguards a home office PC and other electronics (monitors, printers, scanners, speakers, fax machines, CD/DVD players and iPods) from surges, spikes, sags, brownouts and other power abnormalities. Its composite integrated circuitry offers advanced lightning protection. This UPS system is ENERGY STAR® qualified and utilizes GreenPower UPS™ high-efficiency design to save on energy costs by reducing energy consumption and heat buildup. 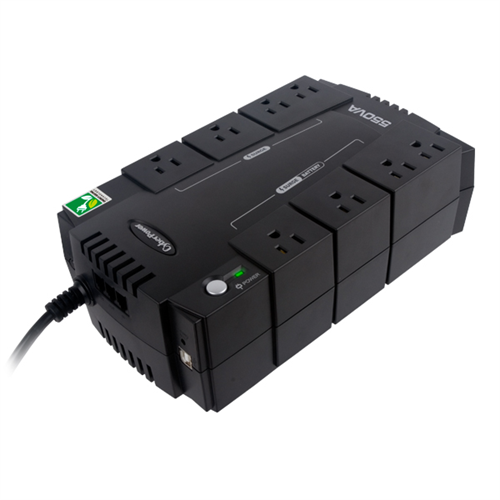 The CP550SLG unit has a capacity of 550VA/330Watts, eight (8) NEMA 5-15R receptacles, widely-spaced to accommodate transformer-based plugs. Its compact design allows for horizontal or vertical placement, or it can be conveniently mounted on a wall. This UPS has a maintenance-free, 12V/5.5Ah battery and offers connectivity via one (1) HID USB port. Protection for phone/network (RJ11) is also included. EMI/RFI filters increase the immunity of the load to disturbances and surges. PowerPanel® Personal Edition UPS Management software is included to monitor the vitals of the UPS and will safely shutdown the system in case of a power outage. A Three-Year Warranty ensures that this UPS has passed the highest quality standards in design, assembly, material or workmanship and further protection is offered by a $100,000 Connected Equipment Guarantee from Cyberpower.